Description from Mills, William C. 1914 includes quotes from Squier and Davis 1848 (S & D).
" They consist of a rectangle, with an attached circle, the latter extending into the former, instead of being connected with it in the usual manner, The rectangle measures nine hundred and fifty by nine hundred feet, and the circle is ten hundred and fifty feet in diameter, ... The chord of that part of the circle interior to the rectangle is five hundred and thirty feet. ... The walls of the rectangular works are composed of a clayey loam, twelve feet high by fifty feet base, ... "
" ... are several excavations, ... from which large quantities of the earth have been taken, though much less, apparently, than enters into the composition of the embankments, From the height and solidity of the walls, it might be inferred that this was a work of defence, But its position, in respect to the third terrace which commancls it, strongly opposes that conclusion Still, this objection would not be insuperable, could we suppose that the, walls were palisaded." - S & D" 51. " GPS readings: Google Earth placemark file. "As usual, there are various errors in these measurements ... Instead of being connected by parallel lines as is usual in this class of enclosures, the two are coincident for a considerable distance, the circle forming most of the north side of the square, It will be observed that in the so-called" square" no side is straight. Among the thirteen angles, not including the broken part of the circle at the north, there is not one within three degrees of a right angle, measuring in straight lines between the intersections forming the corners of the "square," the lengths of the sides are 957, 791, 962 and 825 feet." 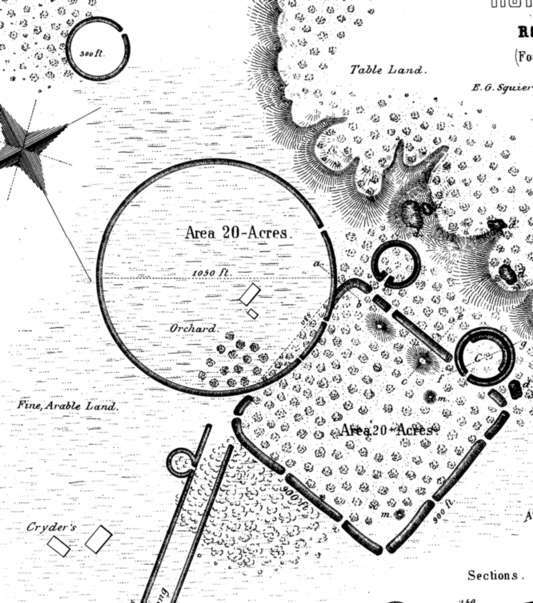 "The circle was surveyed by 100-foot chords on the middle line of the embankment; the angles varied from 159 degrees 20 minutes, to 178 degrees 4 minutes; only two were identical (172 degrees 12 minutes), and these were four stations apart. The polygon thus described had thirty sides of 100 feet each and one side of 98 feet ... east and west diameter is 1,018 feet; that north and south 960 feet." 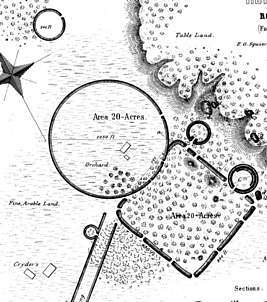 "The included area is a little less than 18 acres, or about the same as that of a regular circle with the mean diameter of 989 feet, The circle, at least, could not be defensive ... the walls are made of-the material near by -sand, clay, loam, and gravel, mixed; probably much of it was taken from the terrace bluff just above. Had clay been wanted, it could have been procured in abundance." "In the "Portfolio," Vol. II, No, 5, November, 1809, opposite page 419, there is a cut of the Hopetown works, The parallel walls are represented as being connected with the circle on each side of a gateway in a line with the west side of the square. At the other end, the walls are similarly connected with another circle, about the size of that at the southeast corner of the square. The smaller circle has no other opening than Hopetown, that leading out between the parallels. 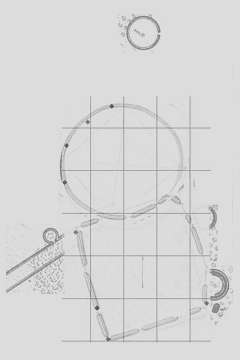 This small circle had evidently been destroyed by the river between 1809 and 1845 ... "
Located across the Scioto river from Mound City, Hopeton Earthworks is another of the geometric earthworks that the Hopewell Culture is so noted for. It consists of a square and attached circle still discernable after a century of plowing. In the following photo, several excavation trenches transect the west embankment of the square, visible as a low rise in the field. While many of the works are now invisible or nearly so due to agricultural plowing or town plotting, Hopeton's major works remain discernable in most places. Early aerial photography, from the 1930s, shows most of the features surveyed by Squier and Davis. By the 1970s, the minor earthworks were full eroded due to modern farming equipment. Originally, the square walls were 12 feet tall and fifty feet wide. The square extends out of this image on the right. The south embankment is visible, though difficult to discern in this view. Parallel embankments extended from the work, herein the far right corner of the square, southeast towards the Scioto river and Mound City. The large circle is located off to the right, and encroaches on the north square wall. A smaller circle encroached on the square east wall in the foreground. Note the gravel plant near the river, and the water tower across the river near the Mound City enclosure. Although Hopeton Earthworks was an officially-listed national historical landmark, part of the designated area was stripped by the former Chief Cornstalk Sand and Gravel Company. In 1992, Public Law designated Hopewell Culture National Historical Park, authorized expansion of the lands at Hopeton and acquisitions protecting the Hopewell, High Bank, and Seip Earthworks from further similar destruction. Other major earthworks in the Scioto and nearby Paint Valleys near Chillicothe remain unprotected. Moorehead, W., 1909. The Hopewell Mound Group of Ohio. Field Museum of Natural History, Chicago. Publications. Anthropological series, v.6, no.5.